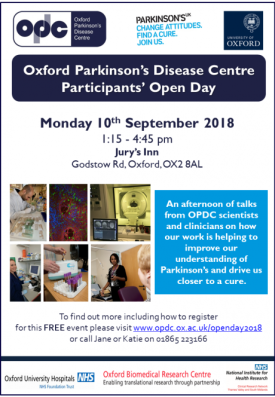 On Monday 10 September 2018, over 200 participants of the Discovery cohort were welcomed to an open afternoon of talks by OPDC scientists and clinicians to hear their latest research and share their views. The event aimed to demonstrate to attendees how their participation is improving understanding of Parkinson's and driving the team closer to finding a cure. DPAG Postdoctoral Research Scientist, Brent Ryan, gave a talk entitled "Screen your stem cell: Drug discovery for Parkinson's." A video of his talk can be viewed here. The full story can be found on the OPDC website, where you can watch videos of all talks from the day.